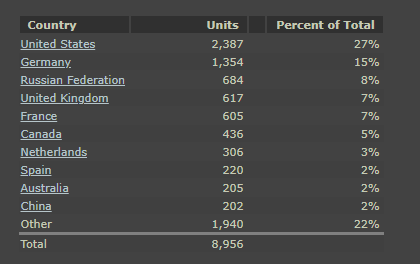 It’s been a month since we launched Winkeltje on Steam, and I thought I’d share some of the numbers from that first month. In the first week, Winkeltje sold just over 6000 copies on Steam (which is also the only platform we’re selling on right now). This comes down to roughly $46,500 in its first week. A month later, that number has gone up to 8956 copies sold, totaling just over $71,000. We will end up getting roughly half of that in our bank account (and then get to pay taxes). It cost us about $45,000 to get Winkeltje to Early Access, so we’re not out of the red just yet but we’re definitely getting there. When we just launched Winkeltje, we received the “Currently Popular” tag on Steam. While I cannot be 100% sure on how this influences your store placement, it does seem to have somewhat an effect on sales. The Green zones in the image above are (roughly) when our game had the “Currently popular” tag. Corresponding with the above zones are the total amount of sales we had per day. 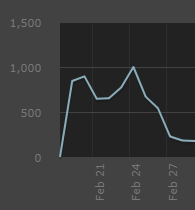 Note that our launch day (Feb 19th) was not our biggest sales day (as is usually the case). Instead, Feb 24th was with exactly 1000 sales. The launch day was only our 3rd largest sales day (845) so far with Feb 25th coming in 2nd at 896 sales. The one statistic I kept finding was that 2000 wishlists is the magic number that you want at a very minimum when launching your game. 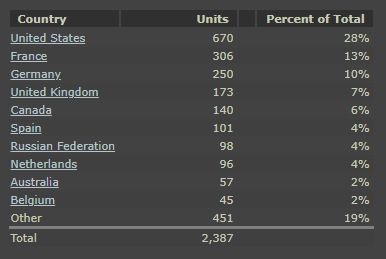 I’m not sure if there’s any truth to that, but the conversion rate (which is defined by Steam as ‘Wishlist purchases & activations as a percent of all purchases & activations‘) of wishlists in those first few days was huge for us: 52% in the first day and hovering between 25 – 40% ever since. When we launched Winkeltje, we had 1975 wishlists. A week before that we only had 414. Over the last month this number has grown to 19967, which I hope will follow the game along as we go through the Early Access process. I’m going to highlight this for a very specific reason, tags seem to matter a lot to how people find games. We added our Steam tags on February 5th, at which point we were averaging 5 wishlists per day. On February 6th this jumped to 45 and then averaged out to around 50 until the first YouTube videos just before the launch showed up. Wishlist additions. The green line is when we added steam tags. When we were looking into what tags we should add to Winkeltje, we simply looked for similar titles and looked at what tags they had assigned. If they were relevant to our game we’d add them as well. Do note that these are the tags that are added through the Steam Store page, not the ones you add in the Store Admin page. When looking at the total sales of the game, there are only a few surprises. We obviously see the USA at the top spot with quite a large margin (which makes a lot of sense, since there’s a lot of Americans on Steam). Let’s look at how this chart looked after the first few days, and how it then shifted around as time moved on. Comparing the 2 charts, there’s a major shift between some of the countries. Notably Germany jumping up from 10 to 15%, which I can only attribute to the German translation being put in after day 3 and some amazing YouTubers making videos in German. Russia also jumped up quickly and France was the one that dropped off fastest. The green line in the above image is when we uploaded the German translations. At this point most of the other countries saw a drop in sales, while Germany was still going up. 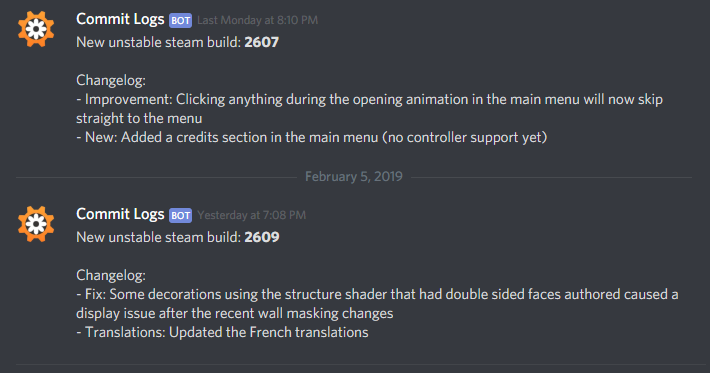 France being so high up in the initial list is probably attributed to a French YouTuber who made a video back when we were still in closed alpha (which prompted a lot of French players to join our Discord) and who then again made a few videos when the game came out. The Simplified Chinese translation has been pushed to the default branch recently, so perhaps I will make another post in a month as an update to see if that increased the sales in that region. All of our translations have been done by the community, who have been amazing in the speed at which they translated the game and how well they keep up with all of our rapid changes (seriously, you guys are awesome). For us, the Early Access launch was only the start of the journey. We’re very happy with how the sales have turned out in the first month, as this will allow us to invest more into the game than we had hoped for. If you’re interested in reading about our pipeline and development process, you can read about that in a previous blog post over here. If you haven’t done so yet, you can buy Winkeltje over on Steam. Winkeltje has been in development for over a year now, and I thought it would be a good idea to look back to where we came from and how we got to where we are now. As you can see, the core mechanics of placing furniture & items, customers coming in and buying stuff and crafting were in there. The biggest change from that prototype is the crafting system which went from fully customizable crafts (as seen in the video), to minigames to a simple progress bar. The Early Access version has gone through a lot of changes. The UI has changed multiple times, and the UX has probably seen about 10 iterations to get it to the current point. Placing Furniture in Early Access, without a grid. Bonus wall masking effect as well! The Radial Menu has gone through a lot of iterations. We initially chose this because it would require little work to get to work with a controller. Over the year this has gotten a lot of changes, we had to try out a lot of different things to see what worked and what didn’t. This is the Early Access version of the Radial Menu, showcasing nested menus and a sneak peek at our developer cheats. One thing we learned from our previous game, Fragments of Him, was the need and desire to quickly iterate on patches. We have spent a lot of time on improving our workflow and pipeline for Winkeltje. Below you see an overview of 2 of the major systems we use to smooth out our production. Winkeltje uses an automated our build process by using Jenkins. Whenever anyone makes a change to the project, we have Jenkins create the game and run through a suite of automated tests ( ~170 ). If all of the tests are completed successfully, a new build is created and uploaded to our ‘unstable’ Steam branch, making it immediately playable for those who want to play the very latest builds. While we can’t catch all bugs, at the very minimum we will know that the game doesn’t crash when booted up and that most of our core features work. Our Perforce commit messages of that build are then posted on a Discord channel. We decided to heavily leverage our Discord for the closed alpha, and will continue to do so during Steam Early Access and after it launches. We have written a small bot that allows us to quickly give someone a steam key, which automatically assigns them the correct user role and provides access to the alpha tester channels. One of those channels is the one mentioned earlier, where the change logs of every build are posted. This kind of integration allows us to rapidly iterate on feedback and bugs as they come up. Our fastest time from reported bug to having the fix up on steam is under 10 minutes. Our users seem to enjoy the direct interaction with us, and being able to fix things quickly seems to be much appreciated as well. It also gives us a great platform for discussion and suggestions. With Fragments of him we used a google spreadsheet to track almost everything about the production. Our tasks, bugs, production overview (scenes, characters, hundreds of animations), trailer storyboards, and much much more. With a different type of game comes a different usage of spreadsheets. With Winkeltje we manage most of the game data in a Google Sheet. This allows anyone in the development team to quickly make changes and have them be reflected in the game. We also support community translations that we import from a semi-public spreadsheet where it becomes pretty easy to support a language if people would like to help with that. Once someone makes a change online, the developer will be able to download the latest version of that sheet inside Unity. We heavily leverage editor scripts for this part. If the changes are as expected, it will be committed and become part of the next build. This process allows anyone to very quickly make balance changes and lets the person in the spreadsheet make use of all the power of formulas and diagrams. Adding new content to the game is now as easy as making sure the model is in-game and adding a new row to the sheet. I will now use this time to tell you to go wishlist the game on Steam! For real, it would help us out a lot. 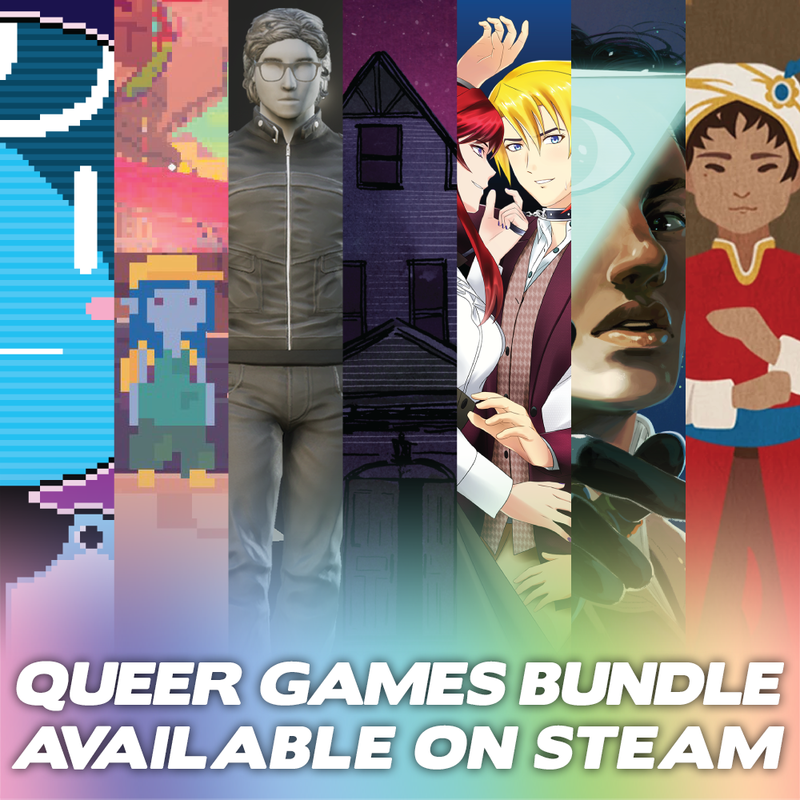 Starting today you will find a Queer Games Bundle on Steam. This bundle contains 7 games from 6 developers. As you might have guessed, Fragments of Him is one of them. To celebrate this bundle’s launch you can get your hands on it at a hefty discount of 50% until August 21st after which it will still be a good deal at 15% off.